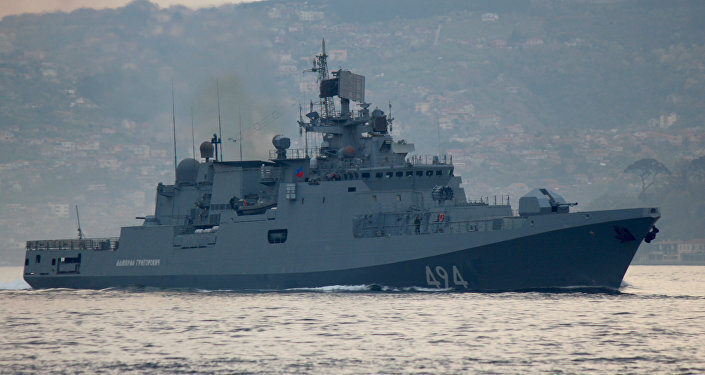 On April 8 the Russian Black Sea Fleet's frigate Admiral Grigorovich returned to the Mediterranean Sea. According to former Baltic Fleet Commander Adm. Vladimir Valuyev, the warship's firepower will strengthen the air defense of troops, forces and facilities in Syria. Earlier in April, the Admiral Grigorovich took part in the Russian-Turkish PASSEX naval exercise in the Black Sea during an unofficial visit by the Turkish warships to Russia's southern port of Novorossiysk. "The Admiral Grigorovich-class frigate returned to the Mediterranean on April 8 after the visit of the Turkish warships. The warship will continue serving within the Russian Navy's group at the Mediterranean until summer of this year," a military-diplomatic source told Sputnik on Monday. The source emphasized that the return of the Russian warship to the Mediterranean was not linked to the US missile strike on the Shayrat Air Base in Syria on April 7. 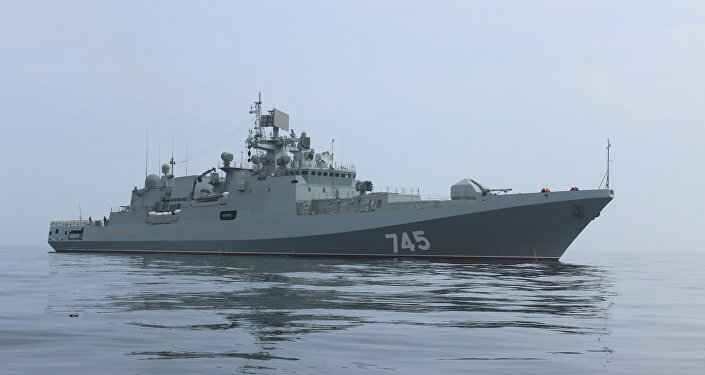 "The visit of the Turkish Naval Forces ships on April, 3-5 was planned at the beginning of the year, and the Admiral Grigorovich-class frigate was chosen to host the visit at the same time," the source specified. Speaking to RIA Novosti on Monday, Adm. Valuyev highlighted the importance of the warship's presence in the Mediterranean. "If the warship is built-into [Russia's] air defense system [in Syria], it will undoubtedly boost it due to the shooting range of frigate's weapon systems," Valuyev said. The Russian admiral highlighted that the frigate's Shtil-1 naval missile self-defense system and naval artillery are capable of shooting down the American Tomahawk subsonic cruise missiles. "The Tomahawk flies on a low-altitude trajectory. If the missile salvo is detected by reconnaissance in advance, it can be brought down, because a missile flying at a low altitude can be detected at a short range. The Admiral Grigorovich has three air defense contours: a long-range (40-50 kilometers); an average (20 kilometers); and a shot-range (5-6 kilometers). The Shtil air defense system, a 100 mm artillery gun and anti-aircraft guns are used [to tackle the threat], respectively," Valuyev elaborated. The warship carries eight Kalibr-NK cruise missiles, a Shtil-1 missile self-defense system, an A-190 100-mm artillery system, anti-aircraft guns and torpedoes. It can also dock a Ka-27 (or Ka-31) helicopter. According to Valuyev, The Admiral Grigorovich can approach American ships at the distance of 10-15 cable lengths (1852 — 2778 meters) without violating the rules of navigation. The Russian admiral emphasized that Russia won't cease to support Damascus regardless of the growing tensions in the region. "We are not going to do this, although Americans behave impudently. There is no such thought to turn our back on our partner," he told RIA Novosti. On April 7, the United States launched 59 Tomahawk cruise missiles at the Syrian military airfield in Ash Shayrat, located about 40 kilometers (25 miles) from the city of Homs. Commenting on the move US President Donald Trump said that the attack was a response to the alleged use of chemical weapon in Syria's Idlib province on April 4, which resulted in the death of over 80 people. The incident was blamed on the Syrian government by Washington and its allies, although no proof was, or has since been, provided. The Russian Defense Ministry said that the attack left two Syrian servicemen missing and four dead; six suffered severe injuries from the fire. Homs Governor Talal Barazi said on April 7 that at least two civilians from a nearby village and five Syrian servicemen had been killed. Russia qualified the US missile strike on the Syrian military airfield as a violation of international law and an act of aggression against a sovereign state. In the wake of the attack, the Russian Defense Ministry suspended the Russo-American deconfliction mechanism aimed at avoiding aerial incidents over Syria.